When I applied to be a team member on the Group Study Exchange (GSE) to South Africa exactly one year ago, I had recruitment on the brain. Student recruitment that is. The Hadley School for the Blind is an international nonprofit organization and the largest provider of distance education to blind and visually impaired adults worldwide, serving 10,000 students in more than 100 countries. GSE would be the perfect vehicle to generate awareness for the school and recruit new international students to study with us, especially because while we have students from South Africa, we didn’t have any that lived in District 9320. So the vocational aspect of the trip to South Africa was very important to me and to Hadley President Chuck Young, who also happens to be a Rotarian wth the Winnetka-Northfield Club. I passed the first hurdle, I was selected as team member. Check. Now it was time to do some research. Fortunately, I had the opportunity to attend a meeting of the World Blind Union in November 2009, where I met the past president of the South African National Council for the Blind. He had contacts. Check. So I did my due diligence and found a number of organizations that were located in District 9320 that I could potentially visit. I shared those with Alicia Mentell and Lionel Health, the GSE Coordinators on both ends and they gladly used my suggestions. All four organizations I would be meeting with were soon on the itinerary. Check. A year later, I am pleased to report that my vocational visits were extremely informative and productive. I had the opportunity to meet with the Nkosinathi Foundation for the Blind in Port Elizabeth, which provides basic independent skills training to blind and partially sighted individuals; the South African National Library for the Blind in Grahamstown, which provides very similar services to the National Library Service for the Blind and Physically Handicapped here in the U.S.; the Students with Disabilities Unit at the University of the Free State in Bloemfontein, which offers extensive braille production and a host of other services to blind students on campus; and Re-Themelang School in Kimberley, a surprisingly well-funded township school serving blind, hearing impaired and multiply-disabled children. All the directors were excited to learn about Hadley’s programs and resources and were definitely interested in learning more. Check. Check. One of the people I met with was the national braille consultant for the entire country. 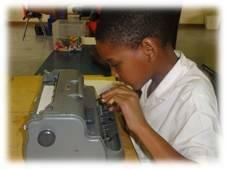 Her name is Pasha Alden and she is the lead authority on standardizing the various braille codes in South Africa. (South Africa has 11 official languages so that’s a lot of braille!). When we started talking, it quickly became apparent that she would be a great candidate for Hadley’s new Executive Leadership Institute, which is an intensive graduate level program for emerging blind leaders. We talked about the new program and I told her I would be recommending her upon my return home. When I learned that the second cohort of students was being recruited last month, I submitted her contact information. He then reached out to her and invited her to apply. She did so and was accepted! I also learned that Pasha had signed up for Hadley’s Elements of Poetry course. At the same time, I had been following up with the various executive directors I had met during the GSE. The South African National Library for the Blind has invited us to submit information to share with their members via their newsletter and website and the University of the Free State is considering Hadley courses as professional development training for its staff. Check!! So all in all the vocational visits proved to be most successful for Hadley, and I look forward to staying in touch with the organizations I visited and recruit more students to our school. I also believe that doing some homework ahead of time was very helpful, and I encourage all future GSE team members to do the same to get the most of their vocational visits. I am grateful to the Rotary Foundation and District 6440 for making this trip possible for me and my teammates (Alison, Angie, Michael and our team leader Terry) and hope that the inbound South African team coming here in April has as positive an experience as we had. Thanks Rotary!